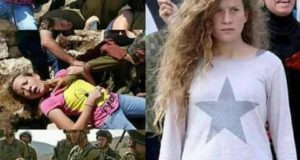 Friday, at the weekly demonstration held in the village of An Nabi Saleh, a young Palestinian was shot by a tear gas canister in the back of his head. Falling down, he was further injured on the front of his head. The military continued to shoot tear gas into the area, without regard for the people coming to help the young unconscious man. It took over 45 minutes before an ambulance arrived, as the army stopped it and prevented them from entering the village. By the time the ambulance arrived, the injured man had regained consciousness. Leaving the village, the ambulance was stopped twice more. The man is now being treated at the hospital in Ramallah. For one year the people of Nabi Saleh have been protesting the occupation, the illegal settlement, and massive land confiscations from their village. In response to village youth confronting the soldiers, each week the Israeli army shoots tear gas into the village and closes the checkpoint for several hours. This Friday at 11 o’clock, 6 jeeps entered the village, bringing many soldiers into the village. After midday prayer the protest began with villagers walking down the main road through the village. Demonstrators attempted to cross the street to reach the spring located on village land but occupied by the settlers of Halamish. 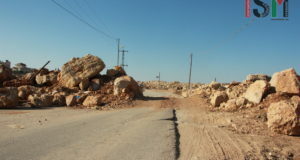 The villagers have been denied access to this spring for many years, which had traditionally served as a water source for the two neighboring Palestinian villages. 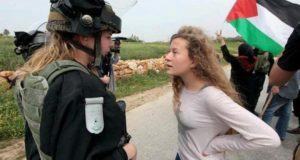 The soldiers began throwing sound bombs between demonstrators, and the demo split up: Israeli and international activists stayed close to the army, and the shebabs engaged in a confrontation with soldiers in the village. At one point a media team interviewed the commander of the army troops. When an Israeli activist asked them to interview someone from the Palestinian side, they refused. The teargassing continued until after sunset, when it was no longer light enough to see anything. One year after the first demonstration in Nabi Salah, the Israeli army still responds to their non-violent resistance with excessive force, making it the most violent and dangerous protest in the whole west bank.